Ayurveda is one of the oldest medical approaches in the world, with roots on the Indian continent. Today, it is practiced all over the world, being appreciated for the numerous benefits it has to offer for general health. The practice of Ayurveda can help us deal with the digestive problems caused by the modern diet, such as bloating, constipation and heartburn. What matters is that we resort to such practices in order to bring balance back to the body and, thus, improve our well-being. Keep on reading and discover more information on the connection between practicing Ayurveda and improving your digestion. According to Ayurveda, there are three elemental substances in the body, known as humors or dosas (Sanskrit). These are represented by wind (vāta), bile (pitta) and phlegm (kapha). In order to maintain an excellent state of health, equality of the dosas is required. When inequality is present, disease occurs. The system of medicine encourages the idea of balance, considering that it is not healthy to suppress one’s natural urges and that such actions often lead to illness. It is also based on the idea that there is a strong connection between the physical, mental and personality dimensions, each one with the capacity to influence the others. The holistic approach promotes the concept that vitality can be attained by maintaining a good digestion and building a healthy metabolic system. From a difference perspective, Ayurvedic practices can improve digestion and general well-being. Life balance and a healthy diet represent two of the most significant concepts proposed by Ayurveda. Certain factors disturb the balance of the body, causing both physical and emotional stress. Interestingly enough, our diet and the food choices that we make falls within that category. The food that we eat should provide us with energy. However, by making poor food choices, we end up feeling sluggish. The modern diet, often based on excessively refined foods, sugar and other substances with inflammatory properties, has a negative effect on the digestive fire. When toxins accumulate in excess, symptoms of digestive problems begin to appear. Heartburn, constipation, flatulence and bloating are just few of the signs that our diet is not what it should be. It is important to be aware of the fact that not all foods are good for the body. By eating the wrong foods on a regular basis, you will end up disrupting the health of the gut flora and suffer from digestive complaints. Extreme emotions during a meal, such as anxiety and stress, can make matters worse, as well as eating right before going to bed or having irregular eating habits. When we strive for good digestion, we are also guaranteed that we will be able to maintain the best possible state of health and general well-being. Ayurveda teaches us to follow a number of steps in order to improve digestion and feel better overall. If you want to improve your digestion, you have to give up the modern diet and everything it entails (refined & processed foods, sugar, additives, preservatives, etc.). Instead, you should opt for fresh food, with ingredients that are highly nutritious and appetizing. The sour taste is characteristic for citrus fruits, while salty can be easily obtained with soy sauce or olives. Spices give the pungent taste, while dark greens and dandelions can offer a bitter flavor. Last, but not least, cranberries, pomegranates and unripe bananas are perfect for the astringent taste. 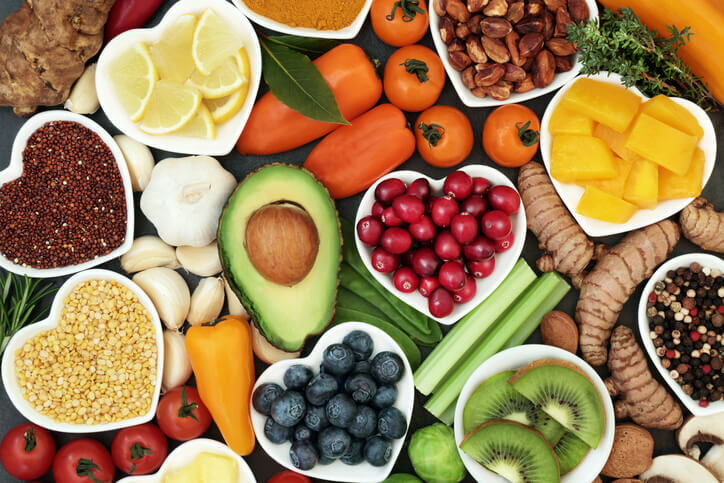 While raw food is recommended because of its rich content in beneficial vitamins and minerals, its excess consumption can do more harm than good. Heavy foods, as well as those that are fried should be excluded from the diet. You should also pay close attention to the food combinations you are making. For example, you should never eat bread with potatoes, or potatoes with meat, as you will have a hard time digesting both. ● Attention to food combinations. Ayurveda teaches us about moderation and the return to healthier eating habits. You should always avoid eating heavy meals in the evenings, as this will place an extra strain on the digestive system. Cold beverages and foods are not to be consumed, as this can have a negative influence on the health of the gastrointestinal tract. It is recommended to eat only when you are hungry, and lightly if you are feeling very stressed or emotional. The more you focus on these intense feelings, the less attention you will pay to the food you are eating. This can cause you to choose the wrong foods, eating compulsively and in large quantities. Poor digestion and dissatisfaction are highly likely to follow. The best thing you can do is wait until you feel better, before eating your meals. Breathing exercises can help you deal with negative emotions and calm yourself in an efficient manner. Deep breathing, with practiced inhaling and exhaling, can be useful in overcoming such feelings. Enjoy your meals only after you feel calm, relaxed and at peace. As any Ayurvedic practitioner will tell you, if you want to improve your digestion, you have to be present when eating. Food is often shared, the company making the eating experience even more exciting. When sharing a meal, do not be in a hurry and sit down, enjoying yourself and the presence of others. You can also begin your meals with grace or by stating the reasons for which you are grateful (for example, for the food present in front of you). Moderation is a key concept in the practice of Ayurveda, including when it comes to maintaining a healthy digestion. No matter how hungry you are, you should never eat until you are ready to burst. The idea is to get up from the table while you are still hungry. You can also consider taking a short walk after each meal, as this will facilitate the digestion process. For proper digestion, it is advisable that you should eat every four to six hours. Snacks are not recommended, as these can place an additional burden on the digestive system. The largest meal should be eaten for lunch, when the sun is up in the sky. All meals should be eaten while you are relaxed, preferably in an environment that is soothing. Avoid watching television or using the computer while eating. Instead, concentrate on the taste and flavor of your food, paying attention to textures and colors. Be thankful for your meals and enjoy every bite. For breakfast and dinner, you should eat less, as smaller quantities of food will be easier to digest. ● Short walks after each meal can do wonders for the digestion. The modern diet is one that encourages food cravings, increasing the risk for obesity and subsequent health problems. Emotional eating is often encountered, with dietary habits being driven by negative emotions, as well as anxiety, sadness and anger. We become accustomed to patterns of eating, without being aware that these are damaging for the digestion and general health. Ayurvedic practitioners often recommend the usage of spices to maintain a healthy digestion. You can use turmeric, the golden spice, to stimulate the digestion and prevent inflammation. Ginger can reduce excess mucus, while fennel is an excellent remedy for bloating and flatulence. Fenugreek can reduce gut inflammation, helping with the elimination of harmful toxins. Other recommended spices include: coriander, mustard, cinnamon and cayenne. Ayurvedic practices are useful for improving your health, including when it comes to the one of the gastrointestinal tract. The most important thing is that you are committed to making a change, giving all of these practices a try. If you want to remove the toxins accumulated on the surface of your tongue, this is the ideal practice to try out. Why is it important? Well, the accumulation of bacteria, as well as plaque on the tongue can prevent you from properly tasting the food. When you are unable to taste the food, it is highly likely you will use more salt and sugar. Such dietary habits favor excess eating, having a negative impact on digestion and the metabolism in general. What you want to do is take a tongue scraper and use it to scrape your tongue, starting at the back and going towards the tip. The process should be repeated several times, until the tongue is completely clean. Amanda Roberts is one of the authors behind Nutrition Inspector. She writes about health, nutrition and fitness articles to help people live a healthier lifestyle. Follow her on Facebook at Nutrition Inspector.